Today we are introducing Google Voice typing, a feature of Google documents which allows you to dictate and format your documents by voice. Voice typing is an effective free tool. It could prove useful to anyone wanting an alternative to typing. First, what are Google docs? Google documents are one of a range of free tools offered by Google housed in Google drive. The docs, slides and sheets (word processor doc, presentation slides and spreadsheet) are stored in a Google drive, they are online (cloud-based) and they ‘sync’ (all catch up with each other). You can access your Google Drive contents from any device and you don’t need to press save – they constantly update. You can return to earlier versions too. Google docs share many features of Microsoft Office 365 which is available at Sussex which also has a voice dictation feature. Within Google docs you can use the Google Voice Typing tool feature. To take a look at Google documents, register with Google for free here. 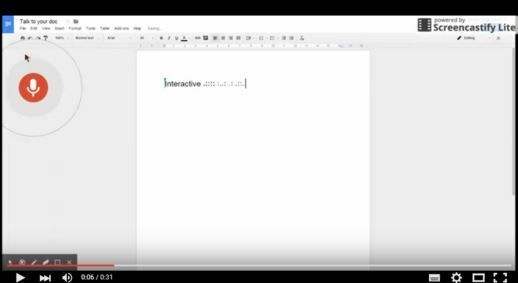 Below is a 30 second video demonstration of Google docs in action. You will hear me talking about how Smart boards work. You’ll see that the Google voice tool captures accurately what I am saying and it also responds well to my voice commands for ‘new line’. 30 second video clip via YouTube. Click to view. You can activate the Google Voice Typing Tool easily within a Google Document. Simply go to tools and then voice typing. A microphone will appear with an invite to ‘click to speak’. Click on it and away you go! The microphone will turn red to show that it is activated and ready for you to speak. 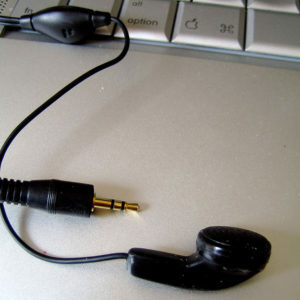 The only equipment required in addition to your computer/device, Wi-Fi access and Google document is a headset with microphone. These are easily available online, the cheapest headset we found was a snip at just £2.50. Just say, and it will be so! As you gain experience in using the simpler voice commands, try and use the voice commands to move around your document by using longer commands such as ‘move to paragraph’ or ‘apply heading 1’. When you have finished with formatting your document, you can download it as a Microsoft Word File and save on to your computer. How could you use this tool in learning? In light of recent Government changes to the Disability Support Allowance (DSA), knowledge of free, accessible inclusive tools can be an effective way to support students in learning. Learning Technologist, Pete Sparkes, highlights a number of effective ways to help students in his recent blog post, Inclusive Digital Teaching Practice. 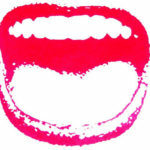 1 Pings/Trackbacks for "‘Speak’ your documents with Google Voice Typing"